This system is not designed for applications that require a continuous flow rate of 40-LPM. If the storage tank is emptied the system will provide DI water at a rate of up to 6-LPM. 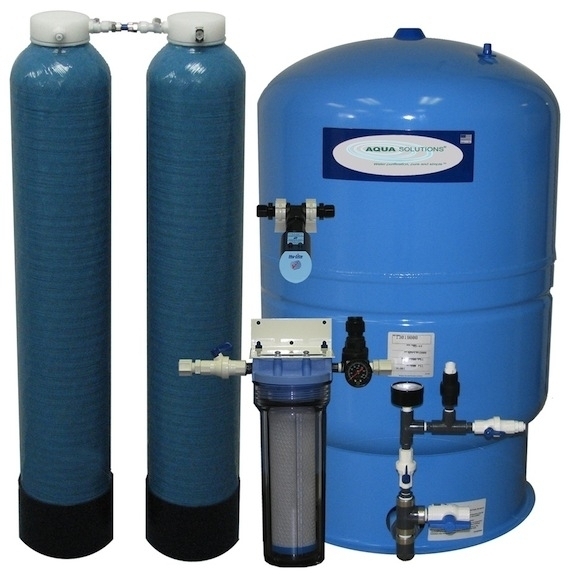 The system includes a carbon pre-filter assembly, three 7" (178mm) diameter by 37" (940mm) tall DI tanks (two installed plus one spare), a 130-Liter pressurized storage tank with ¾” outlet valve, and a 2-Megohm-cm purity monitor with red and green LED’s. When the red LED indicates that the system is no longer producing Type II DI water, the installed (and exhausted) DI tank in the first position is removed utilizing the tank's built-in quick-disconnect fittings. The second tank is then moved into the first position and the spare DI tank is easily installed into the rotation. The end-user can easily do this in a mater of minutes without assistance or tools. The exhausted DI tank is then returned to AQUA SOLUTIONS for refilling. Since all of the system hardware is purchased, there are no monthly rental charges.